Photo chemical machining, also known as metal etching, photo chemical milling, and photo chemical etching is a unique manufacturing process used for complex metal parts that require tight tolerances and intricate designs of various metal materials. 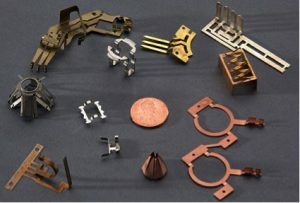 The Photochemical Machining (PCM) process lends itself to designs of low to medium volumes of metal parts from very basic designs to those which are intricate, thin and difficult to handle. In most cases, “If it can be drawn, it can be etched,” is considered the extent of the process’ design capabilities. Most PCM applications produce precise flat metal blanks which can then be formed into various exotic 3-D shapes. Because the metal is dissolved during the PCM process, the original characteristics of the metal such as hardness, grain structure, magnetic properties and ductility are not changed during the process. The metal characteristics are the same from the beginning to end of the process, resulting in Burr Free, Stress Free, Strain Free parts in any temper of material. Microphoto uses precise multiple imaging and can blank parts on sheets up to 30″ wide. The process can work with metals of any temper with thickness ranging from .0005” to heavy gauge. The parts tolerance range can be from ± .001 or less to .010″ depending on material thickness. Microphoto plays an important role in the production of precision parts and decorative items for numerous industries worldwide. We are certified to MIL-STD-45208A and ITAR military standards, and are conform to ISO 9001, ISO 10012-1, NCSLZ 540-1 and MPI 2006 regulations. Microphoto is experienced in machining several different metal alloys, including but not limited to the following. Contact us discuss metals not listed. We’re experienced across various industries ranging from aerospace, automotive, decorative, defense, electronic and medical markets, and are proud to have worked with companies including Stryker Instruments, Lockheed, Boston Scientific, Pfizer, Woodward Governor, Caterpillar Inc., L3 Technologies and many others.